I recently learned a medical term I hadn’t heard before: ‘true knot’, meaning a knot that forms in the umbilical cord during pregnancy. Foetuses move around a lot inside the amniotic sac, and if the umbilical cord is long it is quite possible for it to loop and form knots – sometimes two or more. (There is also something called a ‘false knot’ – when the blood vessels inside the cord fold or become enlarged, giving the appearance of a knot). True knots are fairly unusual, occurring in something like 1% of pregnancies. But this report, published in The Edinburgh Medical and Surgical Journal in 1858, documents an occurrence so rare that no British doctor had seen it before. I have lately met with the following somewhat strange case of twins, and publish it as a medical curiosity. Mrs O., aged 30, in her third pregnancy, was taken in labour at 1 A.M. on the morning of May 12, 1858. I was sent for, and arrived at 3 A.M., and found that it was a case of twins; one child had been born at 2 A.M., alive and healthy; cranial presentation. The nurse was diligently engaged in holding the cord to prevent its “going up again,” and had, from her own statement, been applying some force in traction. The head of a second child occupied the pelvic cavity on my arrival, and this foetus was expelled at 4 A.M., livid and quite dead. A very sad turn of events. But now the doctor noticed something highly unusual. The placental mass was thrown off with comparative facility; the two placentae, blended in one mass about nine inches in diameter, exhibited no trace of division, and showed also that the twins had been contained in one bag of membranes. The twins had been monoamniotic: they shared a single amniotic sac. This is a very rare phenomenon, occurring in only 1% of twin pregnancies. It also means that they were identical twins, coming from a single embryo which had divided only a week or so after conception. From the centre of this mass sprang the two umbilical cords, at about an inch distance from each other; the larger vessels crossed over, but did not (so far as mere inspection could determine) inosculate with each other. ‘Inosculate’, a rare word derived from the Latin for ‘kiss’, means ‘to open into each other’. The doctor means that the blood vessels of each cord remained distinct. The length of each cord was about twenty-four inches. This was not, however, determined with very great exactness. 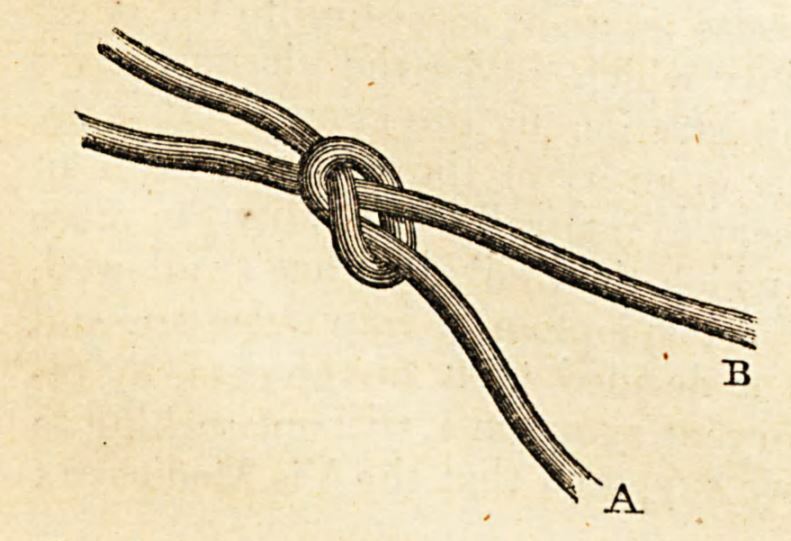 About midway between the umbilicus and the placental attachment of the funis, the cord of the first child, which was readily distinguishable by the ligature placed upon it, was tied in a single knot, and passing through the noose so formed, was the cord of the second child, which, on account of the tightness of the knot, was completely strangulated. This description is difficult to follow, but helpfully the doctor includes an illustration which makes it perfectly clear. The umbilical cord of one foetus had formed a noose around the cord of the other. The children were equally mature and well nourished, so that the circulation through the cords could not have been obstructed for any length of time before death. It has already been stated that the nurse, before my arrival, had exercised some force upon the cord of the first child, by drawing it downwards, from which I conclude that the constriction probably took place at that period. This is possible, although it seems more probable that the noose of cord had been drawn tight as a natural result of labour. The doctor then speculates about the mechanism that might have caused the knotting of the two cords. We now know that cord entanglement is a frequent event in monoamniotic twins, occurring in 50% or more of cases. It is extremely dangerous: if either cord is compressed by a kink or knot, the blood supply to the foetus can be severely compromised. This can lead to oxygen starvation or death; indeed, today the mothers of monoamniotic twins are given frequent screenings to monitor the health of the foetuses in case it occurs. I have, in common with others, on several occasions met with knots drawn more or less tight in cases of single births, but an instance of this kind I have neither met with nor heard of. No work on midwifery gave, to my knowledge, any description of such an occurrence, and Dr West, of St Bartholomew’s Hospital, my esteemed teacher, to whom I forwarded the specimen, informs me that he has never met with a similar instance. When twins share an amniotic sac they are free to move around each other, and the two cords can easily become entangled with each other or with the other foetus – and they very often do. The fact that neither doctor had encountered the phenomenon before merely goes to show how rare these monoamniotic twin pregnancies are.